I am spending this weekend learning how to describe theatrical performances for vision compromised patrons. It is a highly specialized skill, and I have been in awe, watching and listening to four of my skilled colleagues as they describe 2 hour long performances, inserting descriptions between dialogue, and painting the picture of the story, without any subjective terms or personal interjections, so as to leave the patron with a clear, objective view of the story. This all happens as the play is going on! An esteemed trainer, Deborah, has come up from Los Angeles to work with the new recruits as well as the Vancouver veterans. As a way of welcoming her to our fair city, and to help get us through the intense work, I am providing a selection of homemade chocolates. I want them to look pretty, taste good, and be of a quality consistent with someone who has participated in Ecole Chocolat‘s professional chocolate making course. Yikes. 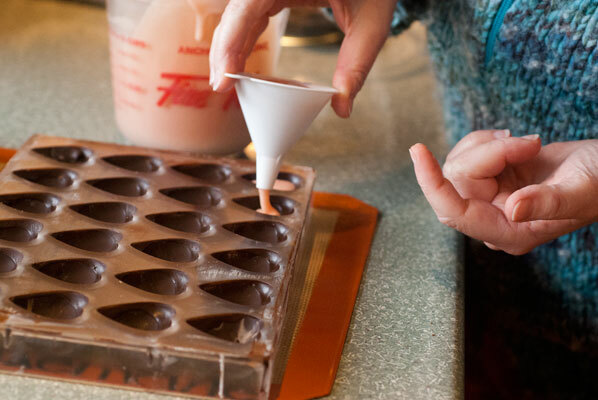 As it is spring (finally) and as far as I am concerned that means strawberries, I have chosen to make a Strawberry White Chocolate Ganache, molded in dark chocolate. I know that Steph and Teri, two of our mentors, are huge Earl Grey tea fans. Come to think of it, most of us in this group are. I wonder if there is any correlation between audio description and tea-loving? So, the second piece is an Earl Grey Tea Infused Milk Chocolate Ganache Truffle enrobed in Dark Chocolate. And in case these both turn out disastrously, I am whipping up a batch of my old pals: Dark and Milk Chocolate Peanut Butter Cups. I realize, in the back of my head, that I have consciously chosen to make these, because they demand three different techniques for the shells – molding, enrobing and … I don’t quite know how to describe making the cups, other than to say painting, because you have to sort of paint the chocolate up the sides of the silicon. And I also wanted to get all three “shades” of chocolate in the mix, as I do love a little white and milk chocolates with my dark. So this weekend has turned into the perfect opportunity to experiment with some techniques and flavor ideas, for a willing bunch of volunteers, who will, at the very least, have honest, descriptive, objective words for whatever they are tasting! 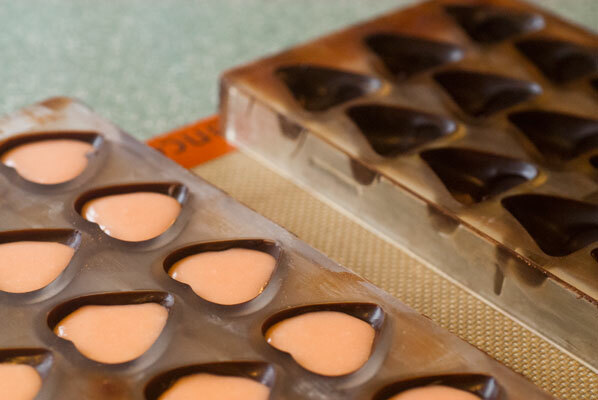 For the Molded Dark Chocolate Shells with Strawberry White Chocolate Ganache, I remember from the Ecole Chocoat ganache lessons and tutorials, that the ratio of chocolate to cream, when using white chocolate, should be 2 to 1. I combine the puree and gently heated cream, and leave them to infuse, overnight. The next day, I gently heat the cream mixture, just until bubbles form at the sides of the pan, and add it avec beaucoup de friction, in five additions to the chopped and 80% melted white chocolate. I am a little concerned that the flavor will be insipid, and since I have just purchased a bottle of Natural Strawberry Flavour (complete with little floating bits of berry), I add in 10 drops to my ganache. At the same time, I add in 5 drops of oil based food colour, to ramp up the vibrancy (a word we use in Audio Description – choose vivid, vibrant words – but describe only what you see – not what you think it means, or want to see). The white chocolate ganache is quite soft. I leave it to firm up a little, as I make the milk chocolate ganache. Perhaps I am feeling a little cocky, but having successfully made a good batch of dark chocolate Earl Grey truffles, I fell as though I can “play” with these ones a little. It smells heavenly, and I put it aside to infuse overnight, also. These ones will be so simple, I think. Famous last words. 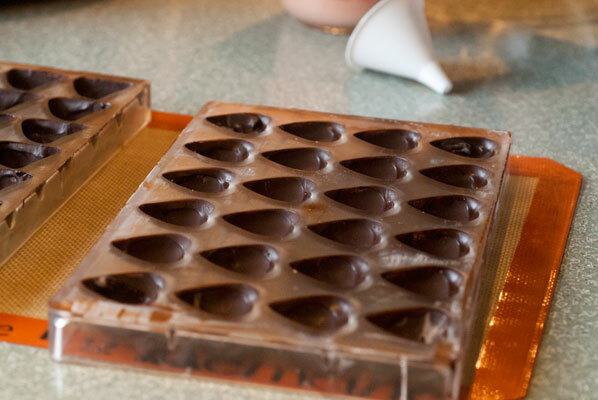 The next day, I am happy and humming, as I successfully temper the dark chocolate for the molded strawberry chocolates. 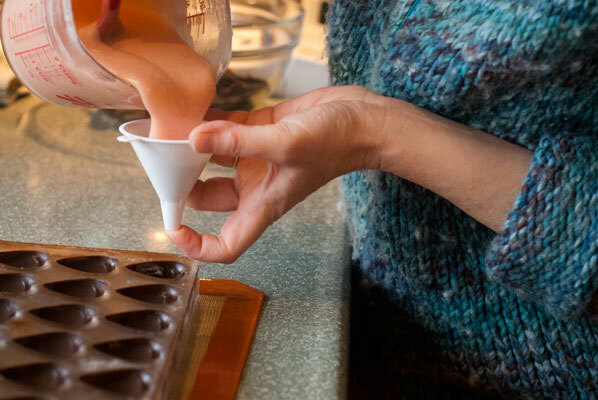 They look terrific, the ganache filling is soft and I get it into the mold cavities evenly, using a small funnel. The backing coating of chocolate goes on. We are in business! 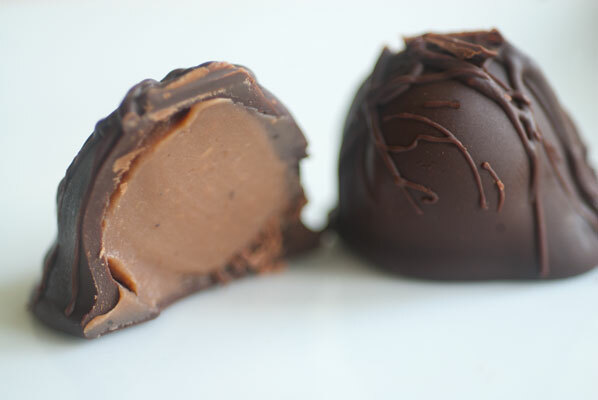 I retrieve my milk chocolate ganache from the refrigerator and attempt to roll it into balls. Oh dear. The ganache is VERY soft, and the balls hold their shape for a few minutes, before oozing into disc/mound/squashy looking shapes. I will not panic, throw things, or curse. I will simply cheat. I get the whole batch rolled on the Silpat mat, then slide that on a cookie sheet into my freezer to firm up. How I can hope to enrobe them, from a frozen state, I will worry about later. I look at the clock and realize I am running out of time. I temper the chocolate for enrobing, and set up my station, as instructed by the marvelous Jenn and Rachel at Cocoa Nymph. I get out my enrobing forks and basket scoop and line them up, next to my “cheater” tool for scraping off excess chocolate, after enrobing. 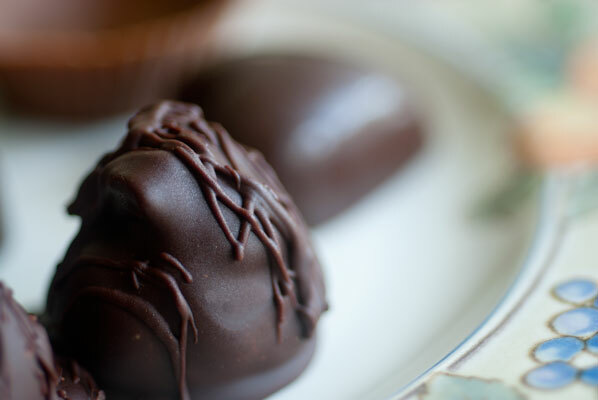 My chocolate hits the correct temper, and I pull my frozen truffle blobs from the freezer. I give each one a quick roll to re-shape it, then chuck it quickly in the bowl of tempered chocolate, roll it over with a silicon spatula, and fish it out with the basket scoop. After one disastrous effort at using the “tap the surface of the chocolate with the truffle for good chocolate pull down” method, and having it merely sink into the basket, wedge itself there and refuse to come out, I realize I am going to have to move fast and furiously, completely sacrificing precision and tidiness. 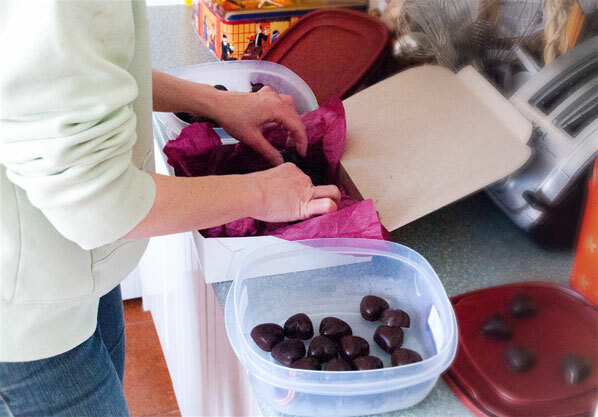 I clean out the basket scoop, re-roll another truffle, and plunge it into the chocolate. I grab it with the basket scoop, and fling it onto the Silpat mat, then go for the next one, not even daring to see how much skirting and mess I have made. It would have been quite amusing, I am sure, to watch me weaving back and forth from foot to foot, getting red in the face, not breathing, flinging truffles down and muttering oaths. The last one enrobed, I have used up nearly ALL of the chocolate in the bowl. I see before me a motley assortment of blobs, completely enrobed, but some with peaks, corners, what appear to be growths. They resemble nothing so much as a forest of fungi. And then I remember the word “truffle”, and what it means, in the first place. I happen to be listening to a radio piece on Pablo Picasso, and I grab my silicon spatula, plunge it into the remaining tempered chocolate, and start flicking it all over the tops of these woeful truffles. In the end, they are no masterpiece, but the filling has stayed inside the enrobed chocolate, and they are covered with a wild swirl that I meant to be there! I put these aside and set to work, on my peanut butter cups. These ones are also going to be a complete cheat for me, and I feel a bit guilty, because I haven’t properly tempered the chocolate. I am running out of time. I have to be at the workshop in an hour. I know these will just pop out of the silicon baking cups. 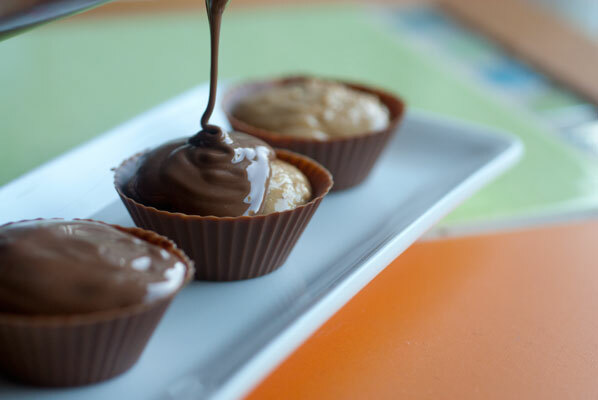 I heat the chocolate gently in the microwave oven, and paint the insides of a dozen miniature silicon baking cups (the mini muffin size) with milk chocolate, then do a dozen in dark. They go into the freezer for five minutes (I know, I know, but I did say this is a COMPLETE cheat), then pop out of the silicon cups. I prepare the peanut butter filling in a Zip-loc bag. This part is actually stress-busting, as I knead the mixture between my fingers. I have two dozen milk and dark chocolate cups, filling squished in, and chocolate carefully spooned on top to seal. I have no time to put them into pretty boxes as I had wished to, or to tidy them up. I have only time to pop out the molded strawberry ones, which thankfully, have worked beautifully. So, I layer them all together, with tissue round the sides, in a cardboard baker’s box. The disastrous-looking milk chocolate fungi on the bottom layer, a layer of peanut butter cups tops these, then, in place of pride, the strawberry molded hearts. I put them in a sealed, chilled bag for the ride to the workshop, where I hide them away in the refrigerator, too weary to even think about presenting them that evening, in fact, forgetting they were there. The workshop is intense, there is so much to learn and we are working our brains and mouths and even our bodies. This work is exhausting – and so cool. And round about mid-day, on Saturday, when we all need a little “pick me up”, I remember the box in the refrigerator, and we attack the strawberry hearts. They are pretty and perfectly tempered and everyone loves them. And the next day, when everyone comes back from lunch and is even more exhausted, they devour the peanut butter cups. And then, toward the end of the final day, when brains are tired and fuzzy, and nothing is coming out the right way, the Earl Grey Fungi are passed around. And I have to say, without exaggeration, just “saying what I saw”, these were the hands down favorite! 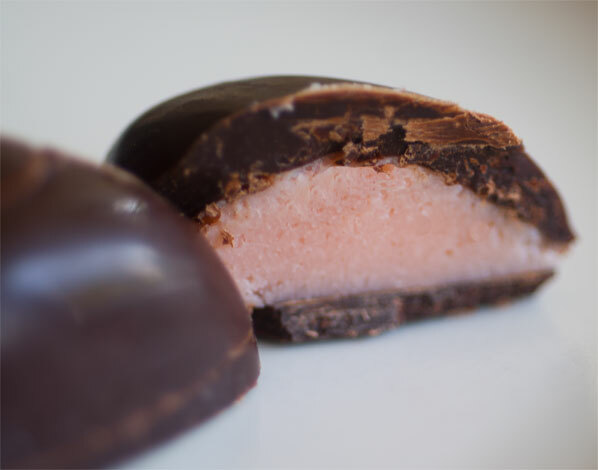 The milk chocolate ganache that had given sooooo much grief, justed melted on the tongue inside the chocolate shell, with a hint of citrus and a little zing to perk up the oh so tired brain cells. So, a picture may be worth a thousand words, but an ugly truffle with a delicious flavor can sometimes be worth a thousand pictures.